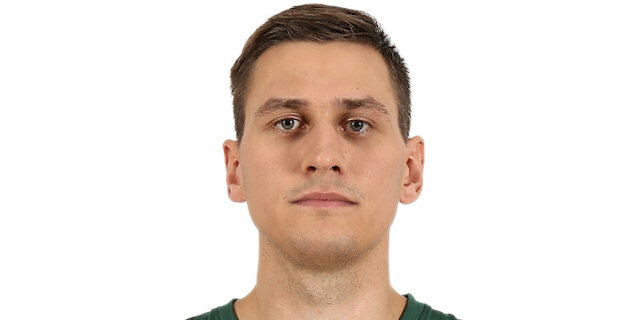 Made his debut with Aisciai Kaunas (Lithuania), NKL, during the 2008-09 season. Signed for the 2009-10 season by SK Triobet Malsta Jonavos. Signed for the 2010-11 season by Zalgiris Sabonio mokykla Kaunas. Signed for the 2011-12 season, signed by KK Baltai Kaunas. Signed for the 2012-13 season by Pieno Zvaigzdes Pasvalys. On January'13 signed by Panevezys Lietkabelis. Signed for the 2013-14 season by Neptunas Klaipeda. Signed for the 2014-15 season by BC Zalgiris Kaunas. Named 2017-18 EuroLeague Round 9 MVP. Won the 2014-15, 2015-16 and 2016-17 Lithuanian National Championship with BC Zalgiris Kaunas. Won the 2015, 2017 and 2018 Lithuanian National Cup with Zalgiris Kaunas. Named the 2015 and 2017 Lithuanian Cup Final MVP. Has been member of the Lithuanian U-16, U-18, U-19, U-20 and University National Team. Won the gold medal at the 2008 European U-16 Championship. Played at the 2013 World University Games.